The book contains a wealth of information on a solution to the growing energy needs of countries. The first chapter depicts the status of and the global trends in the biofuels industry and markets. It traces the history of the production programme of biofuels and the efforts to promote them in Japan, Canada, the European Union, the United States, Brazil, Latin America, South-East Asia, India, China and some African countries. In a situation where the issues of climate change have begun to pose a formidable challenge, biofuels offer a reasonably good option to meet the fuel and energy requirements the world over. Petroleum prices have remained, unpredictably, well over the hundred-dollars-a-barrel mark. In the current geopolitical situation, energy-related issues have become a challenge to national security also. Another important point of discussion, particularly in countries such as India, is the low income levels of the farming community. All these bring into focus one single point: the development and use of biofuels as an alternative to fossil fuels. In the use of fuel in global transportation, biofuels account for 3 per cent and their share is expected to grow to 6.5 per cent by 2012 and to 8.5 per cent by 2015. The second chapter discusses the biofuels in the market, mainly ethanol produced from sugar and starch, lipid-derived biofuels, and their blends with gasoline and diesel, and compares the cost of production of biofuels from different sources to that of conventional petroleum fuels. At 2006 price levels, ethanol from sugar and corn and biodiesel from waste grease are cheaper than petroleum-derived fuels. Sugar crops (sugarcane, beet, sweet sorghum), starch crops (corn, cassava, wheat, sorghum grain), oilseeds (rapeseed, soybean, palm, jatropha) and plant oil feedstock (sunflower, cottonseed, peanut, mustard, coconut, castor, waste vegetable oil) are the first-generation feedstocks that are harvested for the production of biofuels. Starch is converted into sugar through enzyme-catalysed reactions and the sugar, upon fermentation by yeast, yields ethanol. Oil extracted from oilseeds is esterified using methanol and a base catalyst to produce methyl esters of fatty acids, or biodiesel. As regards the technology, proven and cost-effective methods are available to produce biofuels from sugar crops, starch and oilseeds. The yield and quality of the fuel depend upon the feedstock and the technology used. Cultivation of energy crops in tropical areas will be beneficial from the cost and yield angles and the use of plant biotechnology is expected to improve crop yields. Development work in identifying the strains of micro algae capable of producing lipid oils and the search for a technology to produce biofuels from animal fats – from cattle, pig, fish or poultry – are progressing. The largest demand for energy comes from the transport sector. Several agricultural crops hitherto considered not economically significant have now risen to a platform of prominence. The cultivation of fuel crops, production of oil, and secondary treatment of the oil to produce either biodiesel or ethanol have become lucrative manufacturing activities with a host of incentives at various stages. The global production of fuel ethanol and biodiesel in 2006 stood at 38,200 and 6,153 million litres respectively. The U.S. and Brazil are the leading producers of bioethanol. Europe, Germany in particular, produces the bulk of biodiesel. The second part of the book discusses new technologies, feedstocks and prospects for the emergence of biofuels as a viable alternative to fossil fuels. Cellulosic biomass and organic waste, which include grass, wood remnants, municipal solid waste, crop leftovers, and so on, offer large quantities of feedstock for biofuels. But the technology for conversion is difficult and is yet to prove its commercial viability in the current economic situation. Collection and storage, competing fibre usage and environmental constraints also pose challenges. Extensive research is under way to convert lipids and lignocellulosic biomass and organic residues into biofuels with high process efficiency and at a lower cost-per-litre basis. Biomass, thus, offers the best way to tackle the increasing demand for transportation fuels, as a replacement for petroleum fuels. The 21st century witnessed the emergence of national-level efforts to promote wide-ranging energy crops along with foodgrain crops. The technology for the conversion of organic biomass material to biofuels is being developed by a number of institutions through intense research campaigns. A new bio-refinery concept also is being developed. Success in finding an alternative to fossil fuels heavily depends on a breakthrough in this research process. During the development phase, until proven a success commercially, the research programmes need government support through subsidies. Energy economists the world over agree that the potential of biofuels is indeed high and in the future mix biofuels will play a major role. The economic and social issues relating to the development of biofuels are also important. The experience of Brazil is indeed impressive. Following the oil crisis in the 1970s, the Brazilians undertook a bold initiative; they shifted a major portion of their petroleum use to bioethanol and thus saved almost $50 billion in their oil import bill besides creating one million rural jobs. Developing countries such as India and China, whose national economies suffer on account of increasing oil import bills, need alternative options. In the context of an expanding programme for the development of biofuels, several issues relating to agriculture also need special attention. When agriculture expands, the rural economy gets strengthened on account of better crop revenue. The New World Order has brought severe hardships to the farming community in developing countries. In World Trade Organisation (WTO) forums, one often hears the demand from developing countries that developed countries stop their huge trade-distorting farm subsidies while the latter seek access to the industry markets in developing countries though reduced duty. A food-versus-fuel choice is also discussed widely. Farmers, having the choice to convert their food crops to fuel crops, naturally expect a high return from their farmland. Besides, subsidies available for conversion to biofuels also act as incentives for more and more farmers to shift to energy crops. On account of the growth in the biofuels industry, Western agriculture is showing signs of slowly shifting its focus to biofuels. New products, intense activity on farmland, and large government subsidies all bring prosperity to the farmer. But a policy framework that allows an increasing cultivation of energy crops and conversion of foodgrains into fuels does not offer a balanced and sustainable approach for national development. This holds good for both developed and developing countries. The ninth chapter extensively discusses the trade-related aspects of biofuels. Initially, producing countries are likely to divert biofuels to domestic use in order to reduce their import bills. Being large-scale producers, Brazil and Malaysia may become major exporters of biofuels. Some countries may find in this a lucrative avenue to cash in on their unused agrarian production capacities. Still, in the interest of protecting domestic producers, countries may apply tariffs, trade barriers and even trade-related non-tariff barriers to discourage exports. Even so, biofuels can bring cheer to farming communities. 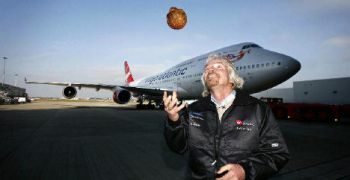 Richard Branson poses in front of a Virgin Atlantic Boeing 747 before it embarks on the first test flight using biofuel made from coconut oil, at Heathrow Airport, London on February 24, 2008. The use of biofuels has immense environmental implications. While the cradle-to-grave carbondioxide emission by biofuels vis-a-vis that by petroleum fuels remains more or less the same, carbondioxide emission by biofuels is widely distributed. This produces an impression that biofuels are more environment friendly. Biofuels being low emitters of carbon oxides, sulphur dioxide, hydrocarbons and particulates at the consumption point, the transport sector has shown a preference for them. Besides, biofuels are oxygenated compounds having better combustion efficiency and they do not contain harmful additives. Consequently, the environmental burden arising out of their use is minimal. However, with the ongoing efforts to improve petroleum fuel quality and engine designs, these benefits may sooner or later disappear. The energy security of several countries depends heavily upon the prospects of biofuels development. Greenhouse gas emission is minimal in the case of biofuels and consequently the impact on environment is low. Market-related issues in the development of biofuels include building the requisite agricultural infrastructure and facilities for transport and storage and putting up processing units or bio-refineries. Currently available engine technologies are compatible with biofuel blends. Engine developershave to consider a situation in which biofuels become more and more popular. Educating people on the potential benefits of biofuels and providing incentives for technical upgradation are very important factors in building a stable future for non-conventional energy sources, in which biofuels have a major role to play. In the matter of development and transfer of technology for processing biofuels, Brazil is the leader. It has developed in-house expertise for biofuel projects from the concept stage to the implementation stage. National-level policy support in the long term is essential for the development of biofuel industries. The 17th chapter reviews the biofuels policies of certain countries. These relate to sustainable production, blending with fossil fuels, quality criteria for products, technology transfer and emission characteristics. The book dwells on the necessity to develop global technical standards to guarantee consumers confidence in the sustainability of biofuels. It lists out recommendations and prescriptions for decision-makers in developing biofuel markets, speeding up a transition to next-generation technologies, protecting resource bases, facilitating sustainable global trade in biofuels and distributing the benefits equitably. It provides details of countrywide studies on use of biofuels for transportation in China, India, Tanzania, Brazil and Germany. The book is contains a wealth of information on a sustainable solution to the growing energy needs of nations and, therefore, is a must read for policy-planners in governments, energy developers, environment strategists, researchers and students. Dr. M.P. Sukumaran Nair, Special Secretary to the Chief Minister of Kerala, was earlier the Managing Director of Travancore Cochin Chemicals.